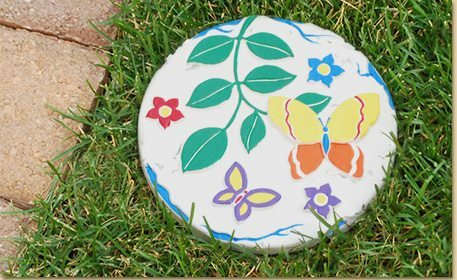 Use the stepping stone kit to create a beautiful butterfly themed stone for your garden. 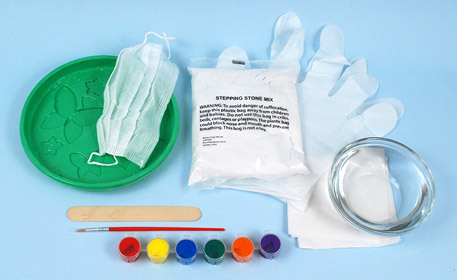 Prepare your area and put on the gloves and mask provided in the Stepping Stone kit. Tip: blow into the gloves to help open it up while putting it on. To protect your clothing, you might also consider wearing a Children’s Smock. 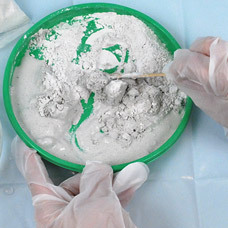 Empty half of one bag of the plaster sand mix into the round mold tray provided in the kit. 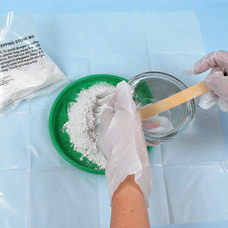 Moisten with the mixing tool provided in the kit. This will prevent the plaster from sticking to it. Measure 1 cup of warm water and gradually pour half of the water into the tray while continually mixing the mixture. 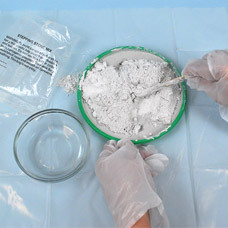 Add the remaining contents of your plaster sand mix into the tray. 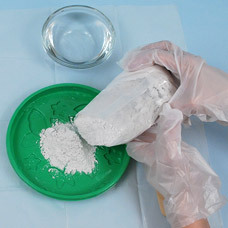 Stir the mixture with your mixing stick until all of the powder has absorbed the water. If the mix is not moist, add more water until it is well moistened. Tip: the texture should be thick like melted ice cream, not runny. 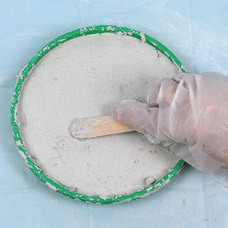 Smooth out the top of your plaster mixture with the mixing stick, moving it in a back and forth motion, like icing a cake. Clean any mixture off the stick while it is still wet with paper towels. Let your stone dry completely overnight. If you try to remove the stone from the tray too quickly, your stone will crack! After allowing your stone to dry thoroughly, remove the stone from the tray. Place the stone with the design facing up on top of your covered work space. 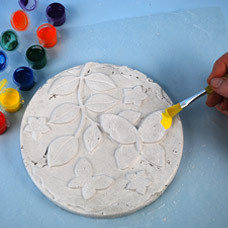 Paint and decorate your stone as desired. 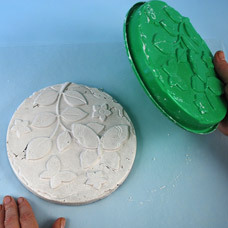 You have now made a beautiful stepping stone using the mold tray provided in the kit. To learn how to create stepping stones in another shape, click here. Once dry, if desired, glue on acrylic jewels for a sparkling touch! Tip: spray with a sealant before putting the stone outside.